Founded on June 15th 2000, the Faculty of Transportation Engineering is a combination of Department of Automotive Engineering (1976), Department of Naval Architecture & Marine Engineering (1990) and Department of Aerospace Engineering (1996). 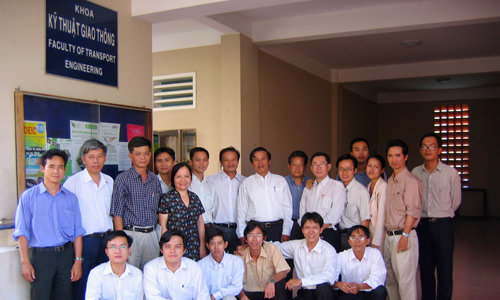 The Faculty of Transportation Engineering – Ho Chi Minh City University of Technology is one of the leading scientific research and technology transfer center in the field of transportation engineering in Vietnam. The faculty’s aim is to train and to provide qualified human resources with solid knowledge and professional skills in relevant engineering fields to meet the increasingly high requirements of diverse activities of R&D, design, manufacture and operation of vehicles in the country. The Faculty has 41 staff members. In addition to main laboratories related to each specific department, since 2004 the internal combustion engine laboratory (ICELab) with modern equipments from AVL List GmbH (Republic of Austria) has come into operation for graduate training program, scientific research as well as technology transfer.